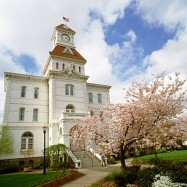 Corvallis is home to Oregon State University, a number of large employers, and beatiful views of the Cascade Range. A naturalist’s paradise, Corvallis was the nation’s #1 Green Power Community in 2009, and is ranked by Outside Magazine as one of the top 20 towns in which to live. Corvallis is known for high life-expectancy, tons of parks, and a high quality of living. Consistently ranked as one of the smartest towns in America, Oregon State University recieves more research funding than all other public higher education instutions in Oregon combined. It is also one of only two Universities in the nation to be a land-grant, sea-grant, space-grant, and sun-grant instution. Complementing the town’s talent, Hewlett-Packard, CH2M Hill, and AVI BioPharma all call Corvallis home.